Presently, Earthwise has the ability to sell both live and processed animals to customers within the state of Texas. You can pick up live animals at our ranch locations near Port Lavaca, Texas or we can make arrangements to deliver them to your location. For packaged meat purchases, we process our cattle at a small, locally owned facility in Gonzales, Texas (Gonzales Processing). They have the ability to handle all aspects of the processing, including custom cut of the meat and shrink wrap packaging. Because this facility is state inspected (as opposed to USDA inspected) we only allowed to sell to customers in Texas at this time. We are selling whole animals (“on the hoof” or processed) and 1/2 or 1/4 portions custom cut and wrapped. We also have ground beef available in 1 pound packages. See pricing below. We will be adding pricing for individual beef cuts soon. When ready to sell, our cattle typically weigh 900 to 1200 lbs and are 3-6 years of age. The yield in typical, edible meats of one of our 4-6 year old beeves will be about 40% or about 350-500 lbs. 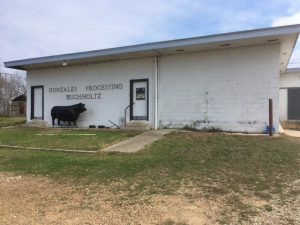 Gonzales Processing (of Gonzales, Texas) will create custom cuts within limits; call or message us for more info on the possibilities or read about some of the different ways of cutting beef here. Custom cuts can only be done with 1/2 and whole animal purchases. A typical cut will yield steaks, roasts, hamburger, stew meat, brisket, soup bones, and dog bones. There will also be fat, tallow, and suet. Buyers of whole, half, or quarter animals can choose to keep the fat, suet, and edible organ meat or it can be left with the processor for disposal. Ground beef can be made to be anywhere from 70-90% lean. 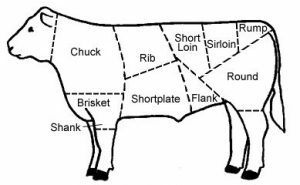 Steaks and roasts can be cut to a specified thickness. Below is a typical list of cuts (and this is the one we use personally) that could be ordered from our processor. According to preference, other cuts may be specified. Thicknesses of some cuts can be specified as well, within practical limits. Ground beef percentage may vary depending on the customer. As an example, if your family enjoys eating a lot of ground beef, you might decide to forego the brisket and stew meat cuts and have them made into ground beef instead. Prices below are for live or processed animals. Prices for live animals are based on the customer picking up the animal in the Port Lavaca, Texas area. Pricing is for live animal weight (per pound basis). Live weight is determined by ranch scale unless other arrangements are made by customer. Delivery can also be arranged. Prices include processing at a state inspected facility (Texas), custom cutting, and wrapping (shrink wrap). Prices listed are for hanging weight when put in cooler at processor. There will be some moisture shrinkage before the final cuts are made. The products resulting from the processing of the animal include all cut and ground meats plus soup bones, dog bones, organ meats, fat, tallow, and suet (see detailed list in left column). Items not wanted by the customer can be left at the processing plant to be discarded. Call us for details on what to expect and the custom cuts available. Below is an example of a “typical” packout you might expect from a grassfed animal. 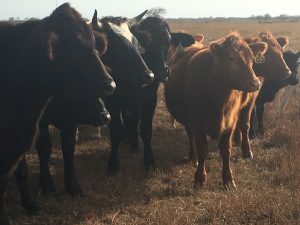 Note that neither Earthwise nor Gonzales Processing can guarantee a specific weight of edible beef as each animal is unique in its frame and fat distribution.